The "Karaoke Iliad" was a performance event commissioned by arts organisation Metal as part of its Village Green Festival held in Chalkwell Hall Part, Southend on Saturday, 30 June 2012. In a workshop held at Chalkwell Hall in the spring, five artists, including Lynn MacRitchie, were invited by Metal to develop work to be presented at Village Green taking the Olympic Games as their theme. In researching the "Towers of Ilium" project, the artist had already discovered that during the ancient Olympic Games in Athens, the "Iliad" was performed as an evening entertainment after the games. It was sung by professional bards (ancient performance poets), who accompanied themselves on the lyre. 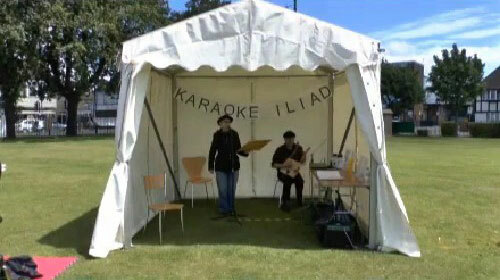 This gave rise to the concept of the "Karaoke Iliad"" in which members of the public were invited to recite extracts from the "Iliad" as part of the Village Green festival events. Charlie Skelton, a musician based in Southend, researched and built a modern version of an ancient lyre which he played to accompany the recitations. The "Karaoke Iliad" was a fun, inclusive event which linked the ancient and the modern Olympic Games, reminding participants of the link between the ancient games and the "Iliad", which would first have been heard much as it was performed at Village Green, before its later transformation into a written text and a cornerstone of western literature. The participants were members of the public who volunteered to take part. All agreed to be videoed and all are included in the video above. (Running time 30 minutes). With special thanks to all the volunteers who took part.